My friend Marcy and I recently visited our friend Sarah in Denver, and she cooked up a storm of beautiful, healthy, and delicious dishes for us. Many of which I’ve tried to recreate since being home. While I might not have the same wonderful company of friends here and definitely don’t have the glorious views of the sky and mountains, I do have the memories. One of my favorites she made was this coconut granola. We had it each morning poured over greek yogurt, fresh fruit, and a spoonful of chia seeds. We also dipped our hands into it throughout the day… and her supply started to become very low. I knew this was one I’d have to make straight away upon my return home. In a large bowl, combine the oats, cashews, almonds, coconut, salt and cinnamon and set aside. In a medium saucepan, melt the butter, agave and brown sugar until the sugar has completely dissolved. Remove the mixture from the heat and stir in the vanilla extract. Pour the butter mixture over the oat mixture and stir to combine until everything is well coated. 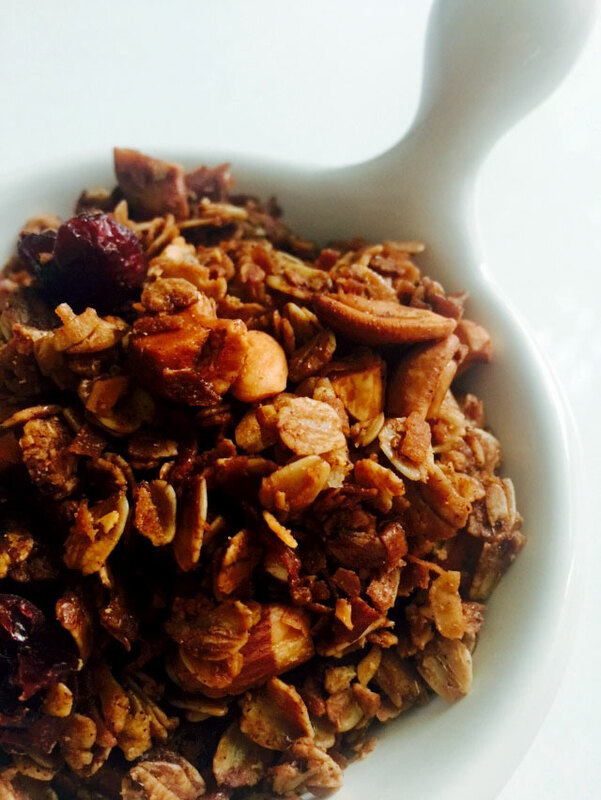 Spread the granola mixture onto a parchment-lined baking sheet, leaving a few large clumps. Bake the granola for 15 minutes. Remove from the oven and break up the pieces to ensure even baking. Place the baking sheet back into the oven for another 15 minutes. Remove the sheet pan from the oven and give it one more toss to break up some of the pieces and place back into the oven for the last 10 minutes. Remove the baking sheet from the oven and let it cool completely. Once cooled, add the chocolate chips and the dried cranberries. Give it a quick toss with a spoon and then package into an airtight container or ziploc bag to store.